Now you can repel those annoying turtle shells. Every Mario Kart player has been on the receiving end of a red and green turtle shell, the latter of which is almost impossible to avoid. Thankfully, Nintendo's finally corrected this issue with the addition of the Super Leaf power-up in Mario Kart 7, the same one that imbues the Mario brothers with Tanooki power. After acquiring this item, players will be able to not only repel those bothersome projectiles, but also whip opponents off the track, presumably their their doom. Although we haven't seen this in action, we applaud the company's decision to balance the game. 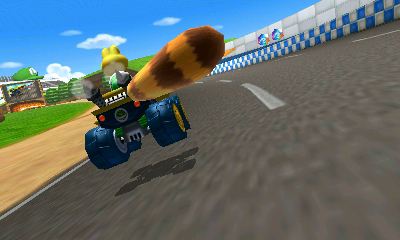 That said, be on the lookout for a raccoon tailed Koopa Troopa.